Independent U.S. Senator Angus King of Maine (above) will oppose the confirmation of Neil Gorsuch to the Supreme Court. 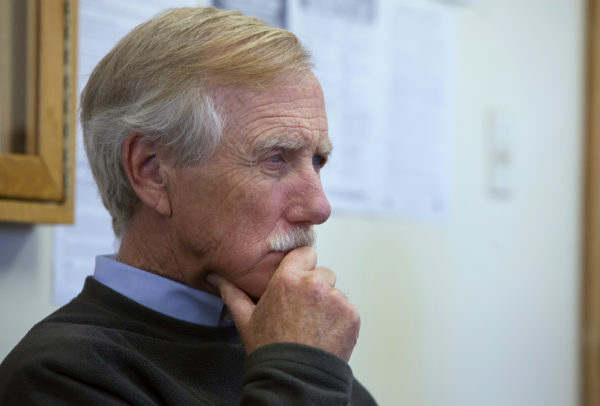 AUGUSTA, Maine — Independent U.S. Sen. Angus King of Maine said in a Tuesday statement that he will oppose Neil Gorsuch, President Donald Trump’s U.S. Supreme Court nominee, and side with Democrats in a likely-to-fail effort to derail his confirmation. King, who caucuses with Democrats, outlined several concerns about the conservative appeals court judge from Colorado in a lengthy statement, including “evasive” answers to senators’ questions about certain cases, his “judicial activist” past and past decisions. His decision doesn’t change the overall political calculus on Gorsuch, who is likely to be confirmed in the Senate, where Republicans have vowed that they will change rules to confirm Trump’s pick if Democrats keep them short of the 60 votes required to break a filibuster. In his statement, King said he’ll also support Democrats’ planned filibuster of Gorsuch’s nomination, saying it’s “not unreasonable to require 60 votes in order to garner broader, more sustainable bipartisan support” for a lifetime appointment to the high court. Even though their bid is virtually assured to fail, King’s vote — his first on a Supreme Court nominee since his 2012 election — will assuage progressives who have been lobbying King and Maine’s senior senator, Republican Susan Collins, to oppose Gorsuch. However, Collins backed Gorsuch last month, urging Democrats not to filibuster. But it provided ammunition to Republicans determined to give King a Democratic label going into his re-election campaign in 2018, especially after three red-state Democrats have already come out in support of Gorsuch. State Sen. Eric Brakey, R-Auburn, announced his run against King on Tuesday. Maine Republican Party Executive Director Jason Savage said in a statement that King “abandoned” his independent label with the vote, placing “far to the left of moderate Democrats” who have supported the judge.